We attended Baby G's P1 orientation on 3rd Nov. When we reached the school, we were told to wait at the canteen. Baby G was very subdued. None of his usual chatty behaviour. He quietly sat and waited with us. When we were told to proceed to the hall, he didn't want to let us go and he acted like we were abandoning him. So we cajoled him to sit with the teacher and promised that we will come back to him as soon as we can. He agreed, albeit unwilling. 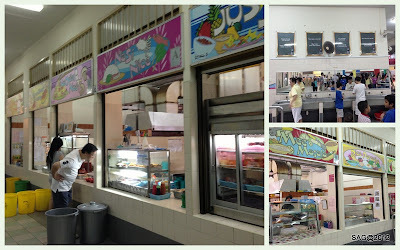 Some shots of the school canteen and the food stalls. 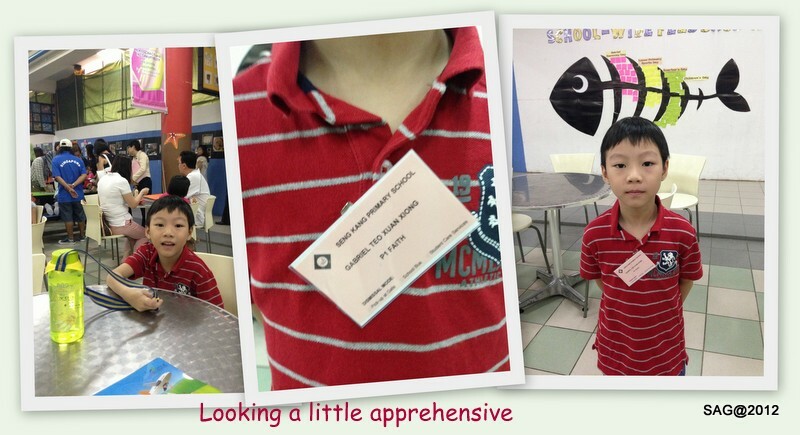 After the orientation program ended, we went to pick him up from the class. What a difference an hour makes. He was back to his chatty self and looked happy. We then proceeded to buy his school shoes and PE attire. By then, it was pretty late so we decided to take our lunch at the canteen. We gave him $2 and told him to get his own food. He was quite game to try. Not badly done, he managed to order a plate of fried rice with slices of chicken cutlet. It cost him $1.50 in total. Pretty expensive and the portions were not really a lot. But he enjoyed the food. 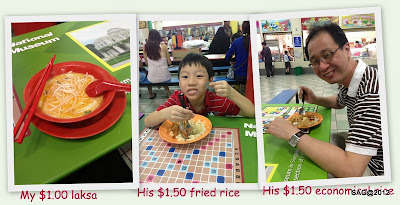 Wondering if $2 is enough for him especially with his hearty appetite. If he had ordered drinks, I think he won't have any money left to save. While he ate, Daddy queued for the purchase of his books. I also started to feel hungry so Daddy bought the $1.00 laksa. Taste-wise, nice, but again ingredients quite pathetic. 3 small fish slices and a small piece of tau-kwa. 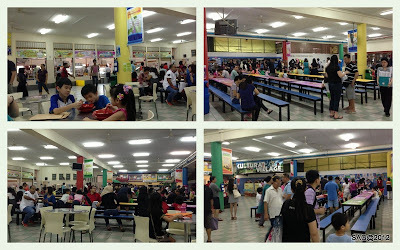 Food is really expensive, even in a school which is supposed to be heavily subsidised. It is with little wonder that everyone says the cost of living is going up and up, even the school children are not spared. 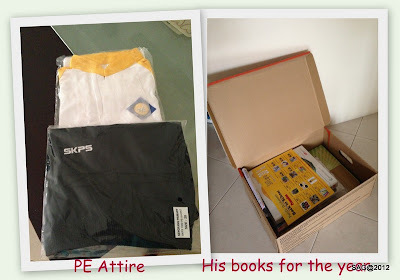 Finally, we managed to get everything except his school uniform which apparently has not arrived from Korea. Wow, uniforms from Korea. Got standard sia. Hahaha. Oh, his class colour is yellow, a colour close to my heart as I was previously from the Yellow team. Like mother, like son. Haha. Looking forward to P1..... another milestone crossed.